The TeraStation III isn't your standard chunk of network storage. Consumer-level storage has come a long way recently, but if you're after a serious amount of disk space, then you're still going to have to pay big bucks for it. But what do you get for your cash? Quite a lot, it transpires. 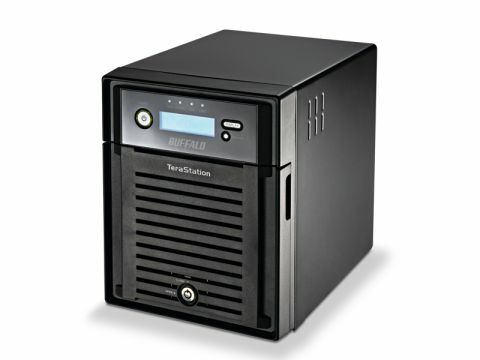 The TeraStation III boasts four 500GB hard drives. It offers full RAID support too, which means your 2TB can be used as raw storage, or more usefully as a fault-tolerant store for your data. The default configuration is RAID 5, which means that you're only presented with 1.35TB of space, but everything keeps working even if one of the drives fails. Slot a replacement in place and you can rebuild with barely any downtime. Performance-wise there's a lot to like. The raw read speed, as measured by Helios LanTest, was good at 8.11MBps. But it's the write speed that really shines, managing 8.19MBps. This is the fastest NAS we've seen. The TeraStation III also supports Time Machine for backing up your drives, boasts integrated BitTorrent and DLNA media servers; even the web interface is accessible and powerful.